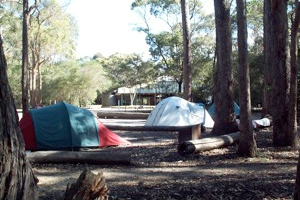 Bournda National Park camping area is located at Hobart Beach adjacent to Wallagoot Lake. School groups pitch tents in the school camping bay adjacent to the large shelter shed. 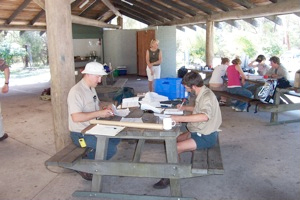 The shelter shed at the Hobart Beach camping area can cater for large numbers of students. The shelter is large enough for over 100 students to gather together under its roof. A number of picnic tables are scattered inside the shed. 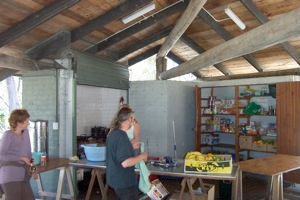 A kitchen is located in one corner of the shelter shed equipped with two sets of gas burners. A barbeque flat plate sits on one set of burners. A large trestle table is also supplied. A lockable storage cupboard is built into the kitchen area for school groups to use.